Two productions at the Aix-en-Provence festival shared one look: empty stage with mechanisms visible, jumbled and mismatched costumes, and a recurring image of light bulbs. One was guided by the music and allowed the alert and stylish singers full range of expression and language, the other was an over-intellectualized mess with so many visual distractions and casting irregularities that only strong musical leadership kept the show from derailing. Erismena is the fourth Cavalli opera to be given at Aix, and the Venetian composer’s particular blend of comedy and seriousness, so commercially successful in the 17th century, is embraced and respected there. Stage director Jean Bellorini boasts few opera credits as yet, but he accepted Aureli’s libretto and Cavalli’s music as powerful stuff. No need to apologize for lyrical recitatives, overstuff the instrumental contributions, or sledgehammer the drag bits. For set, Bellorini and Véronique Chazal used a giant mesh tray that could be tilted, raised and lowered to suggest prison, castle, or wonderland of love (where the massed and clustered lights gave a magical effect), while Macha Makeieff’s 1980s thrift store costumes helped the audience keep track of the large, gender-fluid cast. A recurring joke in the final pages was the popping of a light bulb every time a mistaken identity or plot turn was revealed, and with all the disguises and secret family relationships there are plenty of “Che miro!”s in this opera. The mysterious Armenian warrior who was haunting the dreams of Erimante, King of Media, turns out to be his own daughter (which the superb Francesca Aspromonte proved, baring her chest to display Erismena’s womanhood as well as her vulnerability). The old nurse reveals that Aldimira, a slave girl who’s been toying with various lovers and even falls for the disguised Erismena, is the noble sister of Idraspe, the ex-boyfriend Erismena has come in disguise to pursue. Music-driven staging, excellent casting and a perfect match of material with theater (the restored 18th century 500-seat, 3-tiered Théâtre du Jeu de Paume) made this masterpiece of disguise, heroism, and family bonds moving and effective drama. Conductor Leonardo García Alarcón has made something of a specialty of Cavalli, having directed a comprehensive aria survey, with extracts from all existing works, in a 2 CD set for the Ricercar label. Here he’s made reasoned choices from the various versions of the opera, premiered in 1655 and so popular in its time that a 17th century English-language score exists. Alarcon favors rich basslines and lush continuo. He’s not afraid to blast organ chords and harpsichord tremolos at big moments, but always leaves silence and space for the poetry’s grammar. Often a sprightly passage of music elicited silly dance moves, which then provoked a funky pizzicato reaction from the bass, but this never went too far. The occasional drawn-out and sensuously decorated cadence seemed a genuine reaction to the beauty of the moment. Recorders and soft wooden cornetti took over many sinfonias from the pair of violins, and viols and contrabass joined theorbos, archlutes and guitars in the stage-level pit, already jammed with two harpsichords and an organ. The festival is good to its academy participants present and past, and several laureates of the program were featured. As Erismena, who spends most of the opera in blond boy disguise, Italian soprano Aspromonte was a revelation, her clear, rich soprano both pliant and powerful. In the gorgeous duet, “Occhi bella” her voice twisted, echoed and entwined with the looser soprano of Susanna Hurrell, a spritely and often brash Aldimira. Alexander Miminoshvili’s clear and flexible bass enhanced his kindly interpretation of the king Erimante and baritone Andrea Bonsignore came to vocal life in the big moments as the servant Argippo. Mezzo-soprano Lea Desandre sounded best in the flirtatious Flerida’s intimate moments, though tenor Jonathan Abernethy sounded strained as the prison guard Diarte. 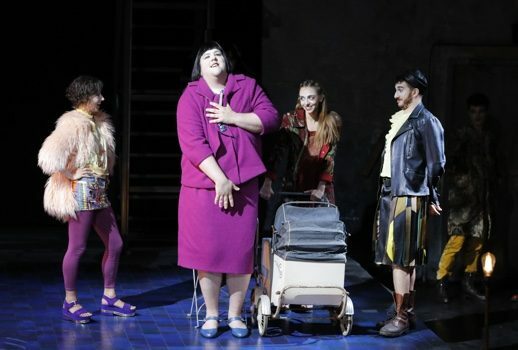 Stuart Jackson’s commanding drag presence, with magenta suit and Louise Brooks wig, made the nurse Alcesta warmly loveable and amusingly smug, and his singing of the high-lying role was terrific. Three countertenors represented various technical schools. Tai Oney’s quivery alto lacks line and focus, though in quieter moments he sounded pleasant, while Carlo Vistoli’s rounded, resonant Italianate sound and elegant phrasing made the most of the role of Idraspe, particularly in more intense musical moments, and he sang with supreme intelligence. With his piquant timbre, Jakub Józef Orlinski, recently of the Juilliard School and heard frequently around New York, radiated star power (and showed off his champion breakdancing moves) as Orimeno, the prince and steady lover who ends up with Aldimira. The story of the abandoned woman who sets out to find her lover and discovers a father as well is Shakespearean in its touching simplicity, and the final quartet brought the opera to a hushed and poignant conclusion. Alexandre de Dardel’s bare stage set for Don Giovanni also featured light bulbs, plus a back wall plastered white, scarred with cracks and holes. Guests at Don Giovanni’s party paint the word LIBERTÀ in red, using a cross (perhaps for the murdered Commendatore) as the T. At the end of Act One, a stage hand begins to bash a hole in the wall that will eventually house the Commendatore’s statue. Visual themes included curtains of shiny gold, rose petals for blood, bare chests (for all the men plus Elvira’s maid) and smoking. In Jean-François Sivadier’s overthought and overwrought production, Don Giovanni is a hero, a hedonistic purist who stays true to his principles to the end. He uses Leporello as a test audience in his attempt to live a theatrical life, but Masetto and Ottavio seem drawn to him as well, perhaps envious of a wild-child lifestyle seemingly without consequences. Giovanni strips down to undies and kneepads to accept his fate head-on, dies outstretched upright like Christ on the cross, and sways and dances as his victims deliver their moralizing ensemble, finishing the opera downstage for a challenging glare at the audience. Two stagehands provide running sight gags. Most of this is background clutter, but provides amusing relief from the oddities of the main action. During Masetto’s “Ho capito,” one sits idly by ordering the other to tie up the gold curtain for Giovanni’s party (where the host appears in Pierrot makeup and a giant curly blonde wig). One joins in the hip-thrusting frenzy of the Champagne Aria. Although the maskers’ trio was a musical highpoint in its delicacy and poise, the party deteriorates into a hostage situation, with Anna, Elvira, Ottavio and Zerlina captive to Giovanni’s gun and Leporello’s knife. The Commendatore often stalks the stage, imploring Ottavio in particular, and knocks over a chair at the sight of Giovanni. Virginie Gervaise’s costumes mix Goya with boho grunge and Philipe Berthomé’s lighting design kept frenetic pace with the staging. This production brings out the humanity of Giovanni’s victims (Masetto is not the usual blockhead and Elvira is clear-headed), as they bond together in sorrow and frustration, but real credit goes to the beautifully detailed and responsive music-making of conductor Jérémie Rhorer. Tempos are swift and flexible, ideally suited to each voice and situation, and his feel for the immediacy of the musical moment is sure. Several singers took advantage of the gentler sound of the Cercle de l’Harmonie’s historical instruments to sing quietly, yet even massive and weighty moments, such as the banquet scene, projected clearly. In the title role, Canadian baritone Philippe Sly offered little vocal charisma, singing flat and often off the voice. Rumors were floated that he was in vocal crisis, so I will quiet down. He did a fine job with the physically demanding staging and delivered a beautifully sensual, restrained Serenade. Singing with handsome tone and linguistic verve, Nahuel di Pierro’s Leporello was a stand-out, providing humor both predictable and spicy (when the Don claims to detect the whiff of a woman, Leporello quickly sniffs his own armpits). Pavol Breslik’s dark and robust tenor, long breath, and voluptuous phrasing (the leisurely-paced “Il mio tesoro” was heavy with import) brought interest and unusual depth to the role of Don Ottavio, while Krzysztof Baczyk’s Masetto was vocally dry but sure. As the Commendatore, David Leigh’s massive, dark-hued sound commanded attention, and for his final appearance he stalked and skulked in a dramatic follow-spot, smoking menacingly (at one point smoke seemed to be emanating from his frock-coat). In the role of Donna Anna, Eleonora Buratto offered a sound that was occasionally unruly, but her vocal coloring and musical imagination are superb, and her voice shows both a warm sensuality and an exciting thrust. Isabel Leonard displayed her customary elegant line, but the sound was monochromatic and her text unintelligible. In this reading, Elvira is the most sympathetic character, so what to make of all her wild and virtuosic vocal writing? If it’s meant to sound noble, Leonard’s delivery registered as merely bland. Julie Fuchs took Zerlina to superstar level, with rich sound and compelling phrasing (“Vedrai carino” was masterfully hypnotic), and her playful physicality brought real focus to Zerlina’s relationship with Masetto. It seems normal at Aix to offer little applause, even for major arias, so audiences save their enthusiasm for the final curtain calls. And with five stage venues at its disposal, the festival can pack the schedule with a variety of productions and start times. The Théâtre de l’Archevêché (home of this season’s Don Giovanni and Rake’s Progress) is an open-air theater in the courtyard of the former Archbishop’s Palace, with an adjacent museum where costumes from past Don Giovanni productions are on display (plenty of ruffles and velvet, with some gorgeous pieces worn by Renato Capecchi, Leopold Simoneau and Leonie Rysanek). The Jeu de Paume is a restored 18th century miniature, where Erismena is given. The 2007 Grand Théâtre de Provence (Carmen, Pinocchio) features a spacious circular stone courtyard for refreshment and gathering. Tips: Neither the open air nor the air-conditioned interiors are too frigid, so leave at home all that cashmere you wear to the Met. Intermissions feature excellent wines and more than enough time to include a cigarette or two. Stay in the auditorium if you require a smoke-free environment. Be sure you know the route, if you are running between shows or dashing from a meal to the theatre, because landmarks come and go. Cafés come and go depending on the sun and the shade, and what was a merry-go-round yesterday is today a fish market. It’s never too late to eat, but you will find little available at 6PM.